Brothers and Sisters may be my favorite “family” show of all times. Being an only child there is something about the idea of having many “brothers and sisters” that I find very appealing; never having to be alone in life or something [mildly sappy] like that. Nothing says thanksgiving like a big family and that’s why I think this is the perfect show to revisit during this time of the year. Saul: If you cook it, they will come? When I started thinking of thanksgiving episodes Gilmore Girls was the first one that came to mind. This episode aired over 10 years ago and I still remembered the “four thanksgivings dinners” dilemma. In summary, Lorealai and Rory end up juggling 4 different thanksgiving dinners [as if eating at one wasn’t enough!]. So we follow the Gilmore Girls to a Christian Korean dinner [we’ve all done that, right? ], Sookie’s garden party where Jackson decides to deep fry everything [what can be more American than that?! ], Luke’s diner and finally the Gilmore’s. As usual a great episode with lots and lots of talking [and eating in this case]. I hadn’t watch this show in a long time and I had such a kick out of all the decade-old references [like the girls talking about Ryan Phillippe’s marriage!]. Perfect thanksgiving episode to rewatch! Lorelai: We are not ‘Michelle-Kwaning’ this! 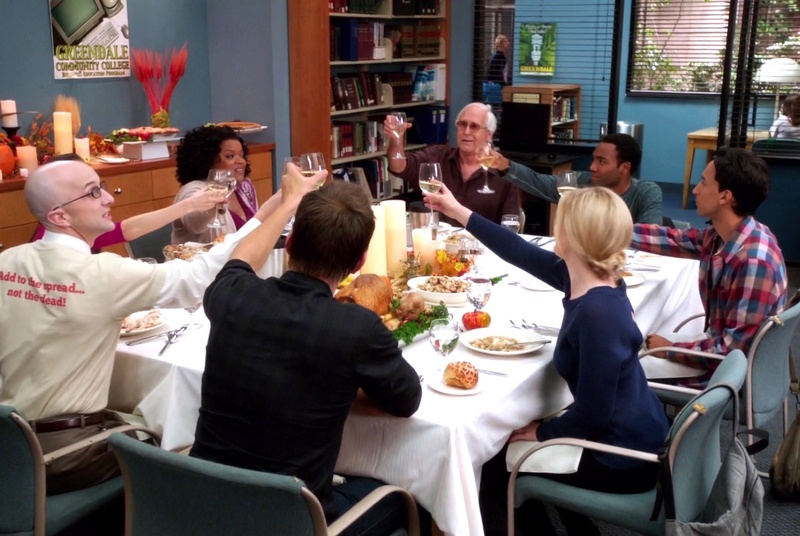 I hesitated to include this on the list because I believe there are are better thanksgiving episodes from better shows [like all the Friends thanksgiving classics, Parenthood, Everwood, etc. ], but there is something about small towns and silly traditions that I find very “thanksgiving-like”. I wouldn’t say Hart of Dixie has a lot in common with Gilmore Girls, but Blue Bell does remind me of Stars Hollow [both seem to have an ENDLESS supply of town festivals… and a gazebo… it could even be the same place in the WB lot, now that I think about it…] and therefore… Dr. Zoe Hart is the somewhat surprise addition to my “thanksgiving re-watch list”. Anyway, Blue Bell folks took thanksgiving-crazy to a whole new level. Forget about pumpkin pie and Turkeys when you can have pirates and treasure hunts! Seriously! It is as ridiculous as it sounds and also the reason it was kinda fun to watch. All town craziness aside, Zoe learns that being a GP is more than having a certain number of patients, it means getting involved with the community. So, as you can see, the episode did honor to the “Thanksgiving values”... and it had pirates… don’t think too much about it… just go with it. Lavon: Planksgiving / Zoe: That is the single stupidest thing I’ve heard since I moved here. And I hear Wade talking to his dates every night on his front porch. From all the episodes I re-watched to write this post, this might be my personal favorite. Until this day I firmly believe no other show has depicted college life as well as Felicity. The show wasn’t a soap opera [at least for the first 2 seasons] and they didn’t focus on scandalous love affairs and promiscuous young adults. They tackled, what I felt, were the issues we all go through in college [like learning to be on your own or wanting a mini fridge for your dorm!). Felicity is also a memento of the golden WB days, where a “young network” was a relatively new concept and J.J. Abrams was still writing episodes himself [and he was great at it!]. In the simply titled episode “Thanksgiving”, Felicity decides to stay in NY to keep Julie company (shortly after she was date-raped). Noel’s high school sweetheart (Jennifer Garner) visits him and things get complicated when Noel’s feelings for Felicity make him take the next step. After a failed attempt at cooking dinner in a microwave Javier comes to the rescue with a giant turkey and the whole gang (Ben, Sean and Elena included) have a surprisingly nice thanksgiving dinner. The episode is about being away from home for the first and learning to move one; discovering that your childhood house may not be your home anymore. At the very end Janeane Garofalo (Dear Sally) has a V.O. speech about moving to a new city where you don’t know anyone and then soon after finding yourself surrounded by a new type of family. I have to confess… that got me a little teary-eyed! It’s something everyone who has been away from home during the holidays can understand. Beautifully written episode, forgot how great the early episodes of Felicity were and it was SO great to watch a show from the 90s! At one point they talk about dial-up connections, it’s hilarious… life was so different! I absolutely recommend going back and watching this episode or watch the entire series if you haven’t before! Sally: It’s incredible really, one minute you are standing in this new city with nothing but your suitcase and then you look around and suddenly, you realize you are surrounded by family. As I said before… nothing says thanksgiving like family, but if you can’t be with your family what you usually get is spending thanksgiving with a very random group of people [been there]… and random groups of people is exactly what Community is all about! So, everyone knows that the Harmon-less Season 4 of the show is probably not the best… yet it had its moments. In this thanksgiving episode Jeff spends the day with Britta and his deadbeat dad while the rest of the gang go to Shirley’s. Dinner at Shirley’s is so awful that Troy, Britta, Abed and Pierce spend most of the day planning their “escape”. As with every other Community episode you really need to know what they are parodying or else you don’t fully get the joke [I still feel I missed out on most of the Dungeons and Dragons episode]. So the required previous knowledge for this episode was Shawshank Redemption [ and some Prison Break]. Shawshank is one of my favorite movies ever, so I really loved the [crazy] concept and all the references… also what other show would ever pair a “prison break” with thanksgiving? Only Community! Britta: Psychology tells us there are no accidents / Jeff: How about car accidents, Tara Reid or the Hindenburg? Abed [to Shirley]: I drew a map of your house on my stomach! 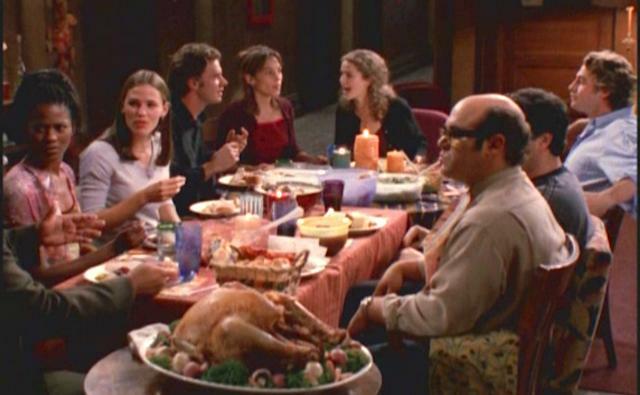 Many other shows had Thanksgiving episodes including some of my favorites like Alias - “Colorblind”. 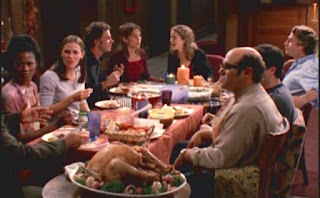 Every episode of Alias is amazing in my eyes, but the reason I didn’t put it on the list is because it wasn’t really a “Thanksgiving” episode… it just happened to be thanksgiving and there was turkey, dinner and awkward family revelations like: “He was the man who killed your boyfriend, in case you didn’t know”; but we also had Syd escaping an insane asylum after she founds her partner with a slit throat… so it wasn’t very “festive”.